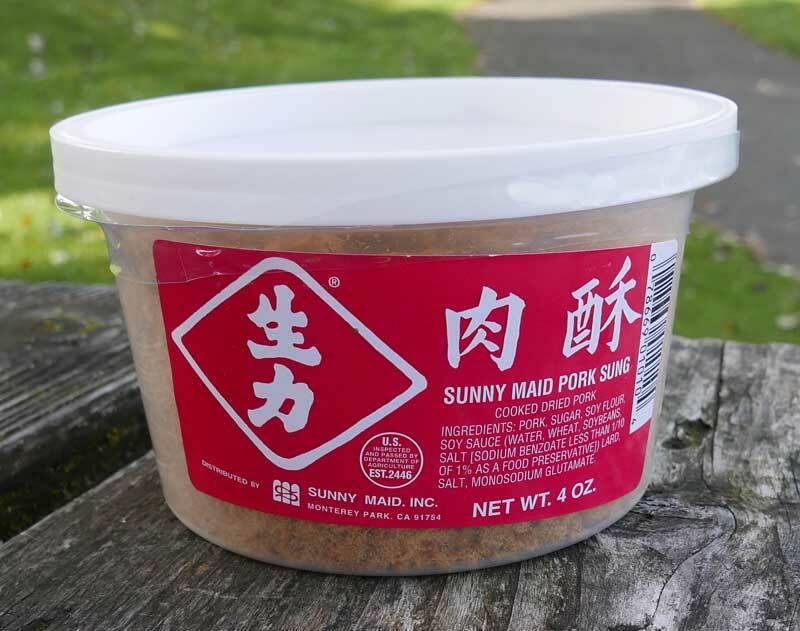 This a light, sweet, fluffy dried pork popular as a topping over rice. In Thai language this is known as "moo yong". It's eaten as a side dish with various soups such as khao tom rice soup or commonly mixed with together with fresh steamed jasmine rice, a hard-boiled egg and seasoned with soy sauce. It's also a famous Thai hors d'oerve, spread nam prik pao on a slice of bread and top with dried pork. You can also add a piece of bread on top of that and it's a Thai Sandwich. Ingredients: pork, sugar, soy flour, soy sauce (water, soybeans, wheat, salt), lard, salt, msg. Khao tom is a staple in Thailand, being widely eaten as a breakfast dish as well as an accompaniment to lunch and dinner. It can be cooked plain (without the shrimp), or as here with shrimp. It can also be made by simple substitution with chicken, pork, or any combination of seafood that you have to hand. It can be made with cooked left over chicken/shrimp etc, or as here with fresh ingredients. It is however almost always made from pre-cooked rice from a day before (though not always left-overs: the cook will often simply ladle enough rice from the electric rice pot to make the soup shortly before serving). Made with chicken it is a popular meal to help recover from illness. This is an authentic Thai sandwich, what you really find in Thailand. In the United States there are all kinds of "Thai Sandwiches" which are American creations such as fried chicken with a spicy peanut sauce in a wrap or on a bun, but in Thailand you typically see very thin sandwiches made of nam prik pao and dried pork as per below recipe.